Alan Pardew wasn’t taking any prisoners in this interview as he talked about the Everton match, technology, ‘rhythm’ and explained his team selection at Goodison on Monday night. 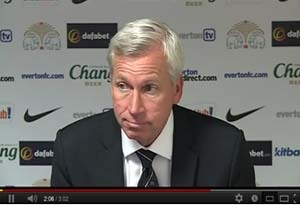 After admitting that, “The first half was as bad as I’ve seen us”, Alan Pardew explained why Demba Ba had been left out. The manager; “The fact that Cisse got the goal for Senegal got him the nod, I was only ever going to play with one striker tonight”.